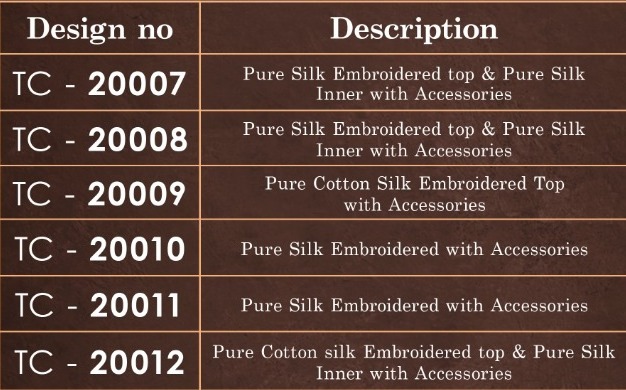 Fabric Details : Poly Cotton With Top And Bottom, Dupatta - Cotton. Fabric Detail : Satin With Top Bottom Dupatta - Chiffon. Fabric Details : Pure Cotton With Top Bottom And Dupatta. Fabrics Details : Top - Pure Heavy muslin, Dupatta - Heavy maslin digital print dupatta four side (2.40 mtrs), Bottom - palazzo daul santoon work with full stich ( free size 3 mtr aprox cur ). Fabric Details : Ready Made Cotton Dress. Fabric Details : Top And Bottom Bith Stitched Full Stitched, Dupatta - Cotton. Fabric Details : Top & Bottom - Silk muslin Fancy Fabric, Dupatta - Nazneen Shibori Digital Fancy Style Readymade. Fabric Details : Rayon To Rayon. Fabric Details : Top - Cotton, Bottom - Cotton, Dupatta - Nazneen Shibori. Fabric Details : Top - Pure Banarasi Chanderi Jacquard, Bottom - Banglory Satin, Dupatta - Banarasi Jacquard. Presenting latest collections of Karma Amaira Dress Material. Fabric Details : Top - Satin Georgette embroidered with Stone work, Inner - Santon, Bottom - santon, Dupatta - CHERRY SILK KATHA WORK.